Valentine’s Day usually comes and goes around here without too much fanfare. We usually buy each other something small. Today LG got the movie, Tommy Boy, a trashcan basketball hoop and a card. I got a cd, a pedicure, and THIS card. I have told you before that LG has a great sense of humor, right? Well, it is just pure coincidence that this post follows the earlier one that is entitled Dead People. But, after reading poor Saxon’s blog, I got thinking back to the days when I was a single girl, not looking forward to V-Day. In High School, my friend Kristen Dillon and I used to sympathize with one another about our singlehood. We used to get each other something small to say I love ya. Two years after we graduated, I lived in Utah and she lived in California. She called me one night because she was so excited that the next day she was going to see our shared HS crush. 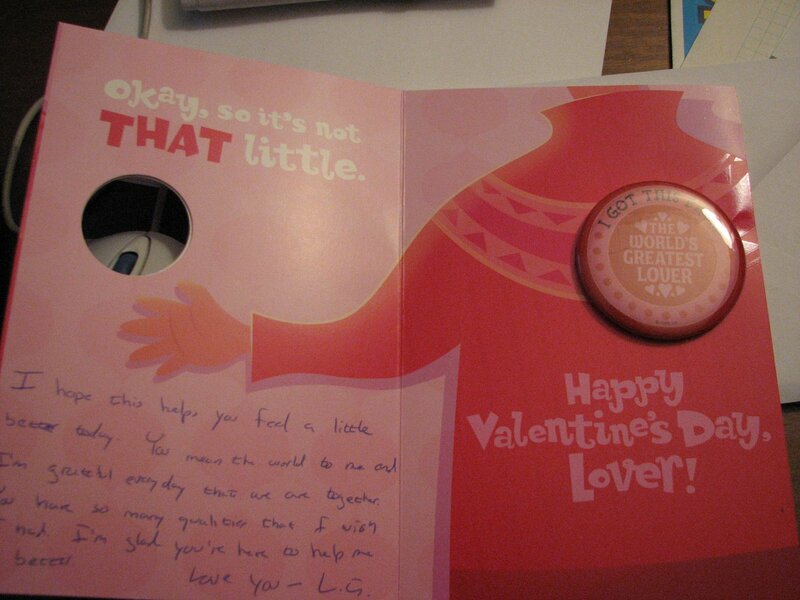 She mentioned in passing that she had a late Valentine’s Day card for me and that she would mail it when she got home. I am not trying to be morbid. You have to realize that this has been 15 years ago. And, I only share this story because I know Kristen is up there laughing about the following story. Kristen died in a car accident on her way to go and see her secret lover. The next week I found myself at her funeral. My sense of loss was very real and debilitating. Kristen’s roommate walked in with a card in hand. As she passed it to me, I saw my name in Kristen’s handwriting on the envelope. Kristen would have loved the irony of this ending. Her and I shared a love of humor and literature. Here I sat, two rows back from her casket, shortly before the beginning of her funeral. The card was passed down the row from the hands of each of our friends. Every person reacted the same: jaw drop. Ah, Kristen, she was always good for a shocking laugh. And, no matter how great each of my Valentine’s Day have been since then, there will always be that one when I was single so long ago. Yes, sometims the love we share the week before Valentine’s Day will always be more important than the actual day. Kristen taught me that. Zero comments….I wonder why?The reunion with your friend will be a sweet one….especially if you were to bring a box of chocolates. That is an incredible story — wow! Really leaves me speechless!Sorry you lost your friend so young. How sad!Happy Valentine’s Day — sounds like LG took good care of you! 🙂 Hope you are feeling much better now! Oh wow, I don’t know what the right word is for what that is. Coincidental? Funny? Amazing? Fitting? Maybe all of those. Did you laugh at the time?